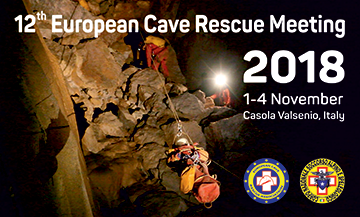 In Trieste, Italy, this October, for the 8th time in a row the meeting of European Cave Rescue Association was held. Again there has been a “meeting inside the meeting” where group of medical personel gethered to discuss medical issues in cave rescue. This group seeks to provide consensus and establish an expert body in cave rescue medicine. When practical, it is proposed to apply/adapt recognized international medical recommendations to the special conditions. The main topic of the meeting were the discussion of the medical aspects of the rescue operation in Riesending-Schachthohle in Bavaria (June 2014) and the topic of the suspension injury . The meeting was held mainly on Friday, while the Saturday has been the day for the presentations and development of the international collaboration.